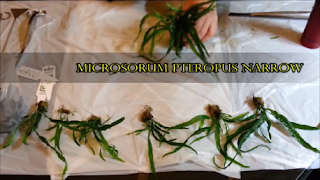 When it comes to suggesting a plant that is beginner friendly and easy to keep, one of the first names to come to one's mind must be for sure Java Fern also known as Microsorum pteroptus. It is a plant that is so easy to keep that it can be grown in tanks with low light, co2 and nutrients. It is a very hardy plant that will survive in almost any condition. It does however benefit greatly from co2 supplementation when used. There is a good amount of variations to this plant, however they are all very similar, apart from size and leaf shape. 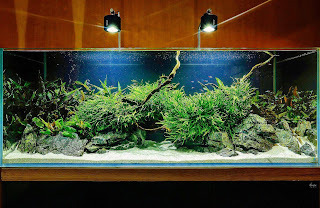 The way to keep them and their needs are all but the same so this post will deal with java ferns in general but can be applied to any of its variations. 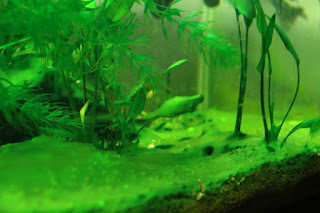 Java fern is a Rizhome plant just like anubias, it's an epiphyte plant that prefers to be attached to rocks and wood. 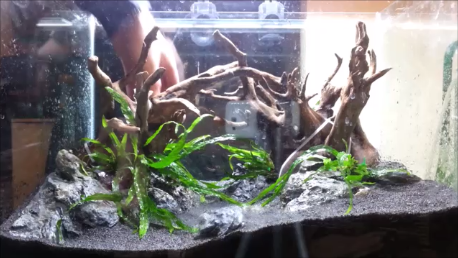 It can be planted on the substrate as long as the rizhome is not buried. However its a plant that prefers to feed from the water column so this should be avoided. This plant is sold in its emersed variation and comes in a pot with Rockwool. Remove the plant from its pot and carefully remove the wool, make sure not to damage the Rizhome or its roots. It comes as one plant, however if you want to plant multiple areas you can break it in smaller pieces. This can be done by breaking the plant trough the rhizome. Beware that, as it is a very slow grower its preferable to buy more pots of this plant than to break it if a maximum coverage is desired. To attach it to rocks or wood you can use cotton thread, fishing line or cable ties. They all work fine and eventually the plant will attach itself trough the roots and you can remove these as they are unsightly. Cotton thread however will dissolve overtime. 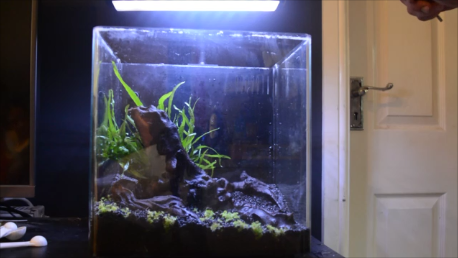 Another way to do it is to attach it using super glue, I have only used this for Anubias at the moment, but the concept is the same and should work quite well. Use only cyanoacrylate glue, place a few small drops where you want to attach the plant and then just place it on it, keep pressure for a few seconds to make sure it stays in place. Sometimes however you can avoid any of these methods by simply finding cracks and crevices in your hardscape and use it to attach the plant, this is my favourite method for this plant. While planting its important to keep the plant moist to avoid it being damaged, so keep some water and a bottle sprayer at hand. Due to their larger size Java ferns should be planted either in the midground or background areas of the aquarium as in the front they would just block the view. Caring for this plant is easy as like mentioned above it grows in almost all conditions. However it is a bit more demanding if you want it to look its best. Overtime it will grow Into a very large bush, this means some leaves may get starved for light and nutrients and start dying off. Also when it gets to this stage it tends to get issues with flow that affects the overall health of the plant. It will also trap a lot of debris which will lead to a decline in water quality. 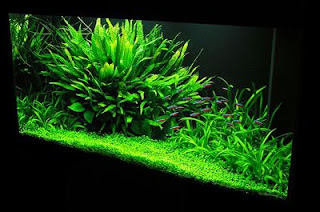 To avoid this the plant should be pruned heavily every so often, also disturbing the leaves and waving your hand around them will help release the debris so they can be removed from the tank either by the filter or with a water change. To trim this plant, just cut the leaves that are either old or not looking healthy. Sometimes they can be removed from the rhizome just by giving a gentle push most times a scissors or scalpel will be needed. In high light tanks there's also a tendency for the leaves to get burned, when this happens transparent or brown spots will be noticeable on the leaves. These should be removed. To avoid it, decrease light intensity. 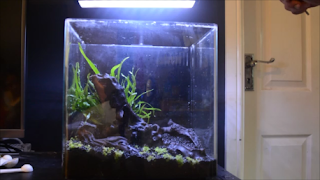 Another thing to be careful in higher light setups is that due to being a slow grower, just like anubias it can get black beard algae easily on its leaves, good plant husbandry and tank maintenance should however avoid this. If not place the plant in shaded areas or decrease the lighting. I have never tried to grow this plant on a dry start method, however during my research I did find some people claiming it's possible. I will update this in the future if and when I am successful. Java ferns are quite easy to propagate you can either split the rhizome into smaller pieces in essence creating a group of smaller plants out of a larger one. 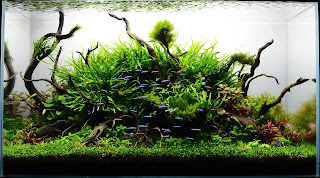 Or if you look carefully you will notice some small growths will start showing on the tips of the older leaves, that is in essence a small plantlet, you can let this grow for a while and then remove it from the main plant and place somewhere else in the aquarium. In time it will grow into a second plant. 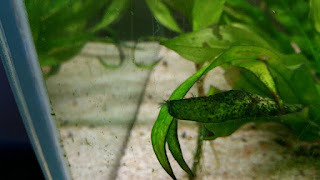 Java fern goes along well will almost all types of fish even cichlids. It may not survive long in a goldfish aquarium though as they will most likely take a dig a it. 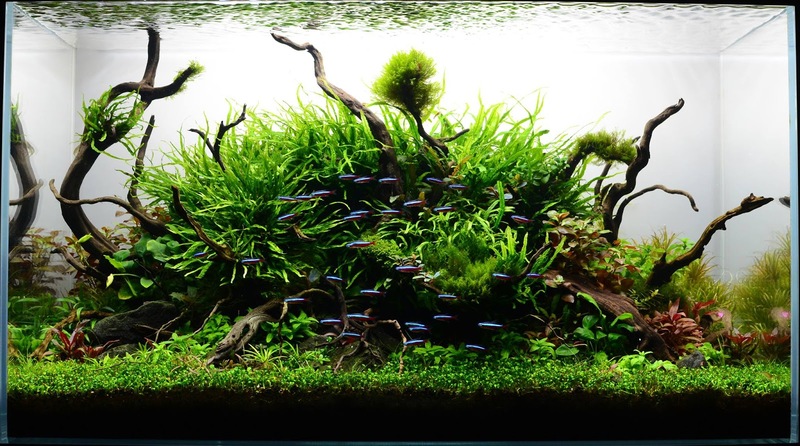 This plant is also great for breeding tanks, as its bushy look and large leafs provide a great hideout for fry, smaller fish and shrimp. This is an easy plant to keep, one that is suitable for beginners, however with experience and time this plant can really look amazing. George Farmer comes to mind someone that really has grown some amazing looking Java Ferns.